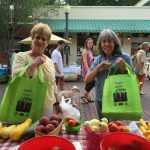 Foot Print is certified as a farmers’ market, which means people can use their Supplemental Nutrition Assistance Program or Electronic Benefit Transfer cards on the farm. Also, starting this season at the MS Farmers Market on Thursdays and Saturdays from 8:00 AM until 1:00 PM located at High Street and Jefferson downtown Jackson, we will have a large booth where we have peppers, tomatoes, lettuces, onions, leeks, and much much more. Plus, we are harvesting great greens, and herbs. This week we will have tomatoes, squash, zucchini, cucumbers, mustard greens , collards green, Turnips greens, City Sweet onions , leeks and introducing our Jamaican Calcaloo greens, with high protein, and fiber it’s known as the energy food .. Great for stirfry, smoothies or traditional cooking. So come see us and get your fresh, delicious vegetables!